"I'm paid—not very much—to nose around, spy, pester people...and to find the truth." Dr. Philippe Morasseau (Jean Topart) hosts the bourgeoisie at his wife's birthday party. Attractive and affluent, they drink excessively and enjoy the evening. In the shadows, a young man looks upon them with anger and perhaps a bit of jealousy. Morasseau and his business partners, the aggressive butcher Gérard Filiol (Jean-Claude Bouillaud) and slithering lawyer Hubert Lavoisier (Michel Bouquet), are involved in a real estate scheme that necessitates that the young man, named Louis (Lucas Belvaux), and his mother (Stéphane Audran) sell their home. Louis' mom is a shut-in, refusing to cave even as Filiol threatens to burn their house down. These are the pieces used by director Claude Chabrol for Cop au vin (or, as the French title on screen says, Poulet au vinaigne—translating to English as "chicken with vinegar"), his bizarrely entertaining thriller. Louis works at the post office with Henriette (played by the insanely beautiful Pauline Lafont) and uses his access to everyone's personal letters as a means of spying on Morasseau and his associates. He becomes suspicious when Morasseau's wife goes missing and takes his spying to a new level as he snoops around the premises, searching for clues. Things are only complicated when Filiol dies in a bizarre traffic accident, prompting the arrival of Detective Jean Lavardin (Jean Poiret), who quickly turns this provincial French town inside out as he searches to find the truth behind the web of deceit cast by its citizens. The screenplay, adapted by Dominique Roulet and Chabrol from Roulet's novel, is equally absurd and mysterious. How things will connect together and for what reason remains largely a mystery, as the audience slowly begins to see how everything fits by following Louis and Lavardin's separate investigations. This is not a detective movie in any traditional sense, but rather a dark comedy that uses the detective genre as a means toward articulating a social commentary. Each character feels genuine and it is not entirely certain what any particular person's agenda is. Who is lying and who is telling the truth becomes blurred, with only the conviction of Lavardin to propel the story forward to its ultimate resolution. Lucas Belvaux is effective as the slightly naïve and curious Louis, bringing a youthful exuberance to his role—especially in the scenes with Pauline Lafont. A stunning beauty, every scene with Lafont is captivating as she comfortably plays the sensual Henriette to such great effect that I became as infatuated with her as Louis does. However, the real highlight here is Jean Poiret. His meticulous performance captures many nuances of Lavardin (particularly his obsession with breakfast) and commands a great presence on the screen. In large part, it is the cast that makes Cop au vin such a success, for without authentic characters there is no way that the story would hold water. The restrained cinematography and subdued production design create a real look that allows the characters to shine. With Chabrol's swift hand at the helm, the acting and script serve up one savory stew. Image Transfer Review: The image is presented in anamorphic 1.66:1 widescreen, with strong contrast and a fair amount of depth in the image. Colors are somewhat bland, but this is likely the intent of the cinematography. Blacks also look sharp. Still, some grain and scratches can be noticed often enough to be distracting. Audio Transfer Review: As far as I can tell, this is a mono mix (the packaging makes no note about it, but the other installments in Kino's Chabrol Collection are all Dolby Stereo 2.0 mixes). I draw this conclusion on the lack of sound separation and rather one-note mix that occupies the front sound stage alone. It's a clean track, but nothing worth getting excited about. Extras Review: As part of Kino's Chabrol Collection, Cop au vin's extras are fairly limited. There's a brief featurette, A Presentation by Film Scholar Joel Magny (03m:07s), that contains a narration (in French with English subtitles) over still images from the movie about the film's context within Chabrol's career and its reception by audiences and critics. 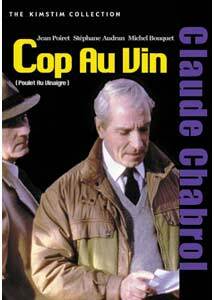 It also spends some time talking about the character of Inspector Lavardin, who later became a French Columbo. The featurette is fairly limited in scope, but its brief length makes it worth checking out. The original French trailer is also presented, in 1.66:1 widescreen and without subtitles. Alas, I do not speak French, so I truly cannot critique the trailer. Nonetheless, it's a rather lackluster set of extras. An engaging story told well, Cop au vin makes for a fine piece of cinema. The image and sound transfers are well done, but the extras are fairly limited on this DVD set. However, the film is worth the price of purchase.